If it’s a dairy cow you’re after then look no further! 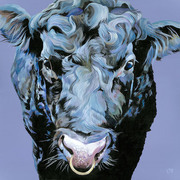 Molly is a classic holstein, and the perfect painting for any country kitchen. Make’s a wonderful partner for Betty Blue. Also available as a Personalised Print and a card.